The elements which were emplaced to save the republic from corruption, namely the FBI (and in a larger sense, the Executive Branch of Government) have failed us all. There is no government standard of integrity that can be called on to vet Hillary Clinton, a liar and perjurer - though those can be said to be some of her more benign traits. 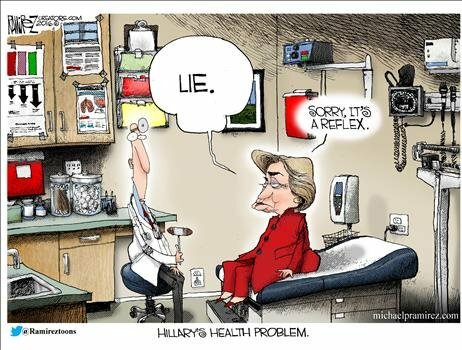 Here is one more analysis of what is likely a chronic health issue that would preclude Clinton from ANY sensitive job in government. Dr. Noel cites a PATTERN of personal health 'crisis events' that Clinton has experienced in public. It's a lot like the Bill Cosby pattern of behavior in that the problem was common knowledge - but was not discussed. Will a chronic neurological disease that impacts judgment and the capability to hold public office be disclosed? Don't expect the mainstream media to engage in journalism. That ship sailed a long time ago.